Interview: In Tennessee Williams’ dark comedy ‘The Mutilated’ at A Red Orchid Theatre, Girten goes for raw truth. Through March 13. 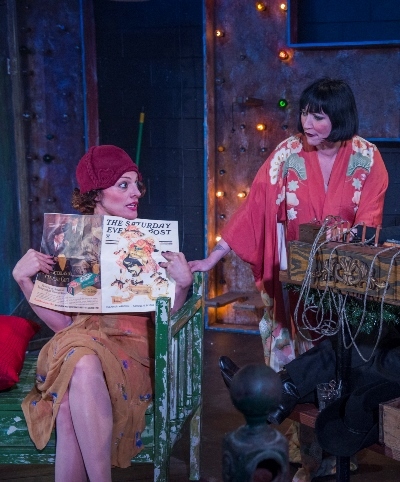 In the most intimate and empathic way, Mierka Girten connects with Trinket Dugan, the character she plays with disarming honesty in Tennessee Williams’ “The Mutilated” at A Red Orchid Theatre. Actor and character share deep, physical, albeit invisible, wounds. The big difference is that while Trinket conceals her mastectomy – her mutilation – in sorrow and shame, Girten talks openly about the multiple sclerosis she has struggled with since her days as a drama student at DePaul University. 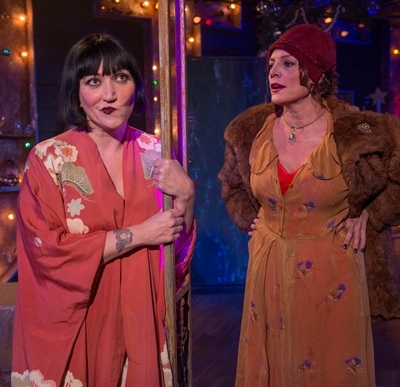 It’s actually ironic, says Girten, a longtime ensemble member at A Red Orchid: The only other Tennessee Williams play she was ever in (or anyway nearly in) was “The Rose Tattoo” at DePaul. Girten’s roles at A Red Orchid have been many and varied, but another shot at Williams never came until “The Mutilated,” which the now veteran actor admits challenged her not only physically but also artistically – in the singular lyricism that sets this playwright’s work apart. Still, surprises happen on stage, and in a preview performance of “The Mutilated,” Girten found herself with no choice but to embroider the playwright’s lines. Trinket, who has resolved to risk embarrassment for the sake of male companionship, picks up a sailor (played by Steve Haggard) in a bar and invites him back to her hotel room. The scene gets a little rough. “Steve is the sweetest person on the planet,” says Girten, “but he accidentally pushed me. I walked back seven or eight steps and fell to the floor. I didn’t know what would happen next. The people who know I have MS must have been alarmed. 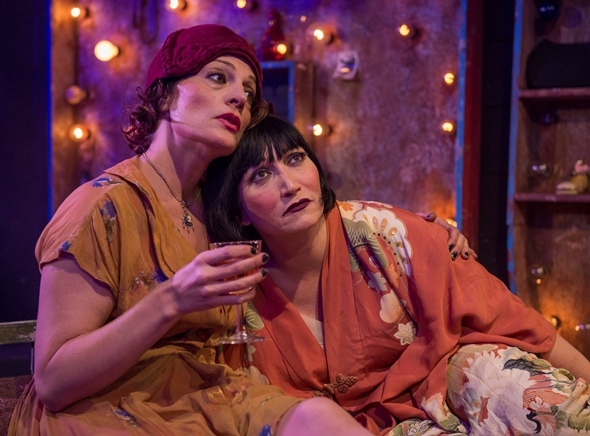 Set in a lowdown New Orleans hotel in the early 1930s, “The Mutilated” is essentially the story of two women, best pals – Trinket and Celeste, the latter a free-loading amoral alcoholic with a lust for life. 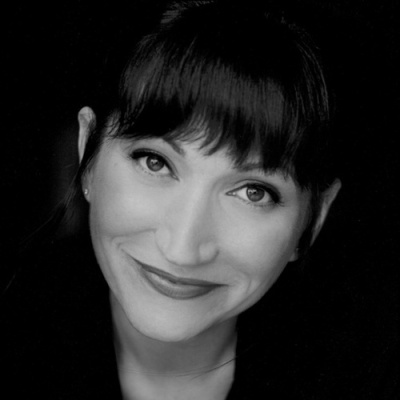 Celeste (Jennifer Engstrom) offers the play’s thematic existential line: “We are all mutilated.” Newly sprung from the hoosegow after shoplifting, Celeste sets her sights on the restorative powers of Trinket’s ever-present wine jug and ever-ready cash from family oil interests. But BFF though they may be, they’re also a testy pair and proud, and their reunion comes about only through darkly comic tribulations. “With Trinket and Celeste, the love has to be there, where you can see it,” says Girten. “Trinket knows the incident with the sailor would never have happened if Celeste had been there. I’ve had a best friend like that since seventh grade, (Chicago actor and singer) Rebecca Finnegan. We went to the Cincinnati School for the Creative and Performing Arts together. I know how much I depend on her as my backbone sometimes, even if it’s just a phone call or a text. That’s how Trinket and Celeste are. The play’s most harrowing adventure, says Girten, lay in the bounding leaps of faith required to go with the novel approach of director (and fellow A Red Orchid ensemble member) Dado. “Dado is a visual artist. She has a master’s in visual art,” says the actor. “She uses the stage as her canvas. She sort of painted with us, with our characters. She would put me on stage, and I’d ask, ‘Why am I standing here?’ And she’d say, ‘We’ll figure it out.’ She added the level of chaos we needed to make it the French Quarter. It is Trinket’s awful truth, the depth and complexity of her pain, that Girten says she has kept before her almost as a moral obligation. “In 1932, people just didn’t talk about this kind of surgery,” she says. “It was deeply invasive, and you might live only five years or so afterward. They would actually remove pectoral muscles. You might be crippled for years. Trinket’s surgery was on the left side, which is the side of me that’s affected the most. “It’s embarrassing and very personal for me, just as it is for Trinket. I’ve spent most of my life being an actor, and I’m always thinking this might be the last show I do. This is not a pretty performance, but I’ve never been shy about telling the truth. If I didn’t show people how ugly she felt, I would not be doing her justice.